President Mahmoud Ahmadinejad has said the opposition protests seen in Iranian cities on Monday are "going nowhere" and vowed to punish their organisers. 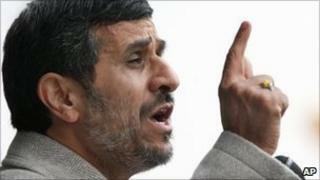 Mr Ahmadinejad told state television that "enemies" were trying to "tarnish the Iranian nation's brilliance". Two people were killed and several wounded in clashes between protesters and security forces in central Tehran, officials said. US President Barack Obama sharply criticised the authorities' response. "I find it ironic that you've got the Iranian regime pretending to celebrate what happened in Egypt, when in fact they have acted in direct contrast to what happened in Egypt by gunning down and beating people who were trying to express themselves peacefully," he told reporters on Tuesday. Mr Obama said the US could not dictate what went on inside Iran, but hoped people would have the "courage to be able to express their yearning for greater freedom and a more representative government". Iranian opposition evolvesWill Iran import Arab uprisings? Not long afterwards, Iran's president dismissed the protests in Tehran and other major cities, saying they had wanted to undermine a rally held last Friday to mark the 32nd anniversary of the Islamic Revolution. "It is clear the Iranian nation has enemies because it is a nation that wants to shine, conquer peaks and change [its international] relations," he said. He added: "Of course, there is a lot of hostility against the government. But they knew that they would get nowhere." Mr Ahmadinejad said the organisers of the protests wanted "just wanted to tarnish the Iranian nation's brilliance". "It is a shining sun. They threw some dust towards the sun... but the dust will return to their eyes." On Monday, thousands gathered at Tehran's Azadi Square in solidarity with the uprisings in Tunisia in Egypt - their first major show of dissent since December 2009, when eight people were killed. Many chanted "Death to dictators". The BBC's Mohsen Asgari, who was at the rally, says it was not long before riot police fired tear gas, while men on motorbikes charged the crowd with batons. The next day, the culture ministry's security chief said Sanea Jaleh, a 26-year-old student and government supporter had been killed. Later, MP Kazem Jalali said one of the injured had also died. Acting police commander Gen Ahmed Reza Radan said several people had been arrested, but did not specify how many. Witnesses told the BBC that dozens of protesters were taken away in police vans. Earlier, conservative members of Iran's parliament called for the two opposition leaders they accused of fomenting the unrest, Mir Hossein Mousavi and Mehdi Karroubi, to be tried and sentenced to death. Pumping their fists in the air, a large group marched through the main parliamentary chamber, chanting "Death to Mousavi, death to Karroubi". "Mehdi Karroubi and Mir Hossein Mousavi are corrupts on earth and should be tried," a statement signed by 221 MPs asserted. "We believe the people have lost their patience and demand capital punishment." The charge of "corrupt on earth" has been levelled at Iranian political dissidents in the past and carries the death penalty. Former President Mohammad Khatami was also criticised. Before Monday's banned rallies, Mr Mousavi was placed under de facto house arrest by the police. The former prime minister's supporters said the move was intended to prevent him attending the rally. Mr Karroubi, a former speaker of parliament and a senior cleric, is also being held under de facto house arrest. Both men disputed the re-election of President Ahmadinejad in June 2009, which triggered protests that drew the largest crowds in Iran since the Islamic Revolution in 1979. The unrest prompted a brutal crackdown. The opposition says more than 80 of its supporters were killed in the six months after December 2009, a figure the government disputes. Several have been sentenced to death, and dozens jailed. Are you in Iran? What is your reaction to President Ahmadinejad's comments about the recent protests? You can send us your views and experiences using the form below.